When thinking back on favorite experiences in a country, sometimes it’s not the big attractions that stand out in your memory so much as the unusual quirks. Which bring me to the wonderland of the Japanese 7-Eleven, one of the more memorable stops in Japan. 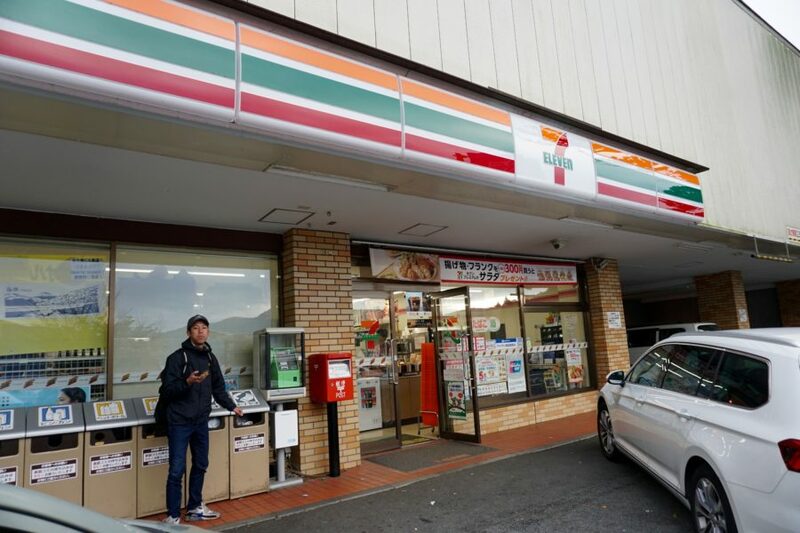 And it’s not just me who is obsessed with Japanese 7-Elevens– ask any traveler and they will often wax poetic about their favorite things from a Japanese 7-Eleven. 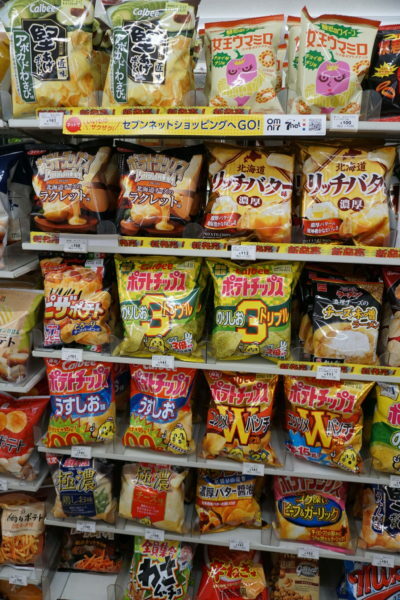 While 7-Elevens are the gold standard in Japanese convenience stores, you really can’t go wrong with any convenience store– the chain Lawsons also has its fans. 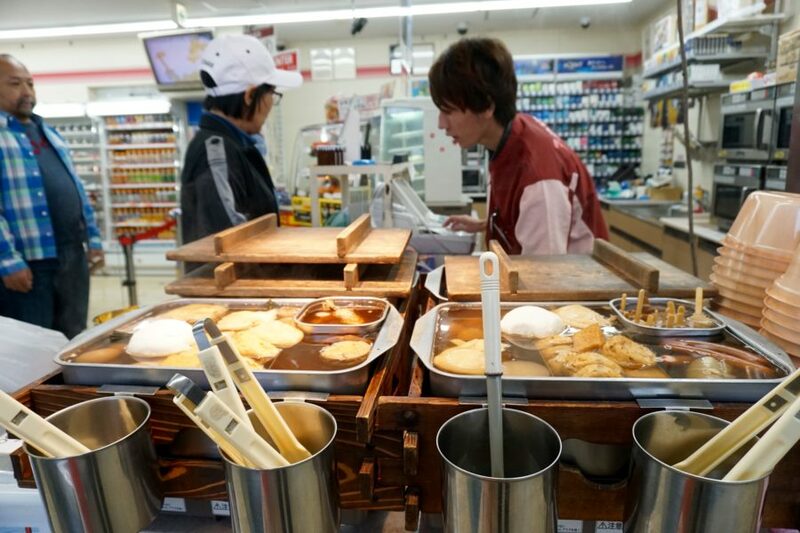 So what makes a Japanese 7-Eleven so fun? Not only are Japansese 7-Eleven covenience stores fun to shop, they are essential for the American tourist– unlike elsewhere, the ATM machines here always seem to work for US cards. 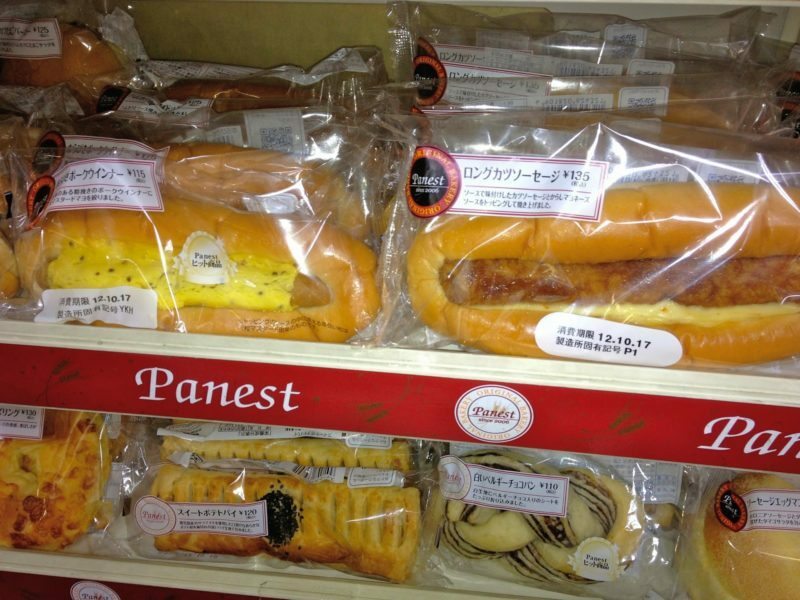 Whereas a US 7-eleven has questionable hot dogs and stale coffee, at a Japanese 7-11 the fresh food actually looks fresh– and tempting. 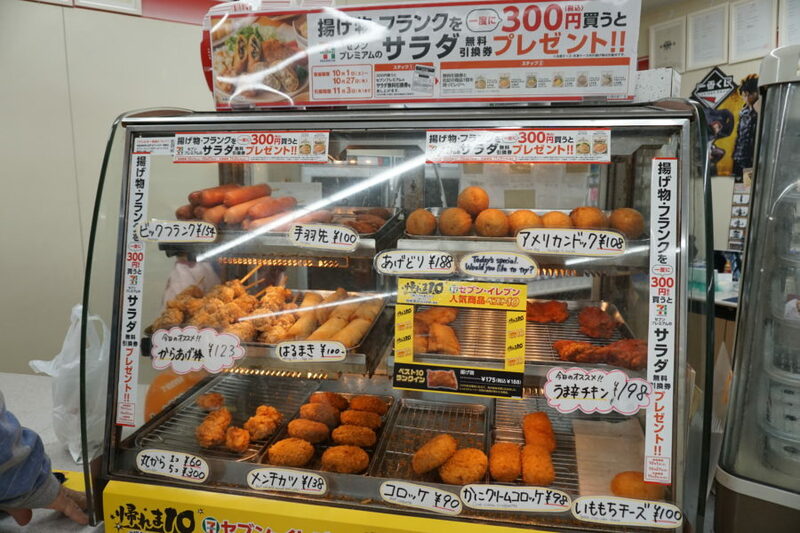 The elaborate fresh food selection at a 7-Eleven in Japan. 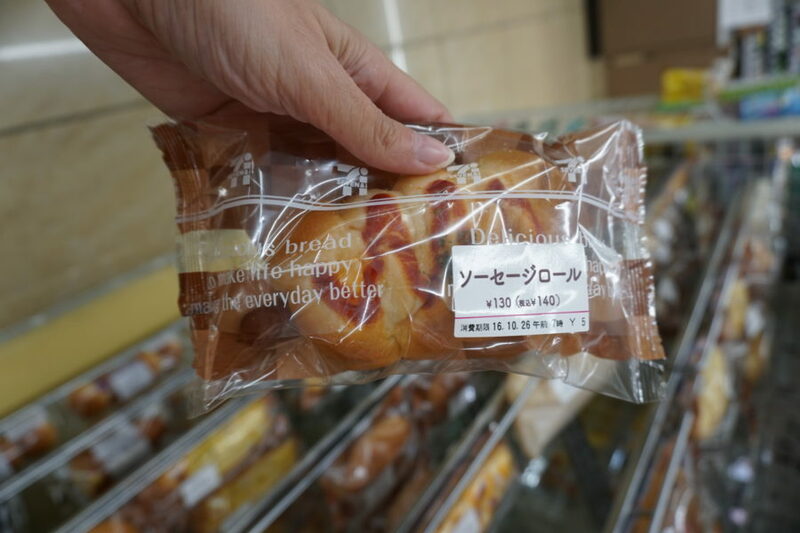 Mostly we grab pre-packaged food like these or onigiri stuffed rice balls which are a deal at around 60 cents. 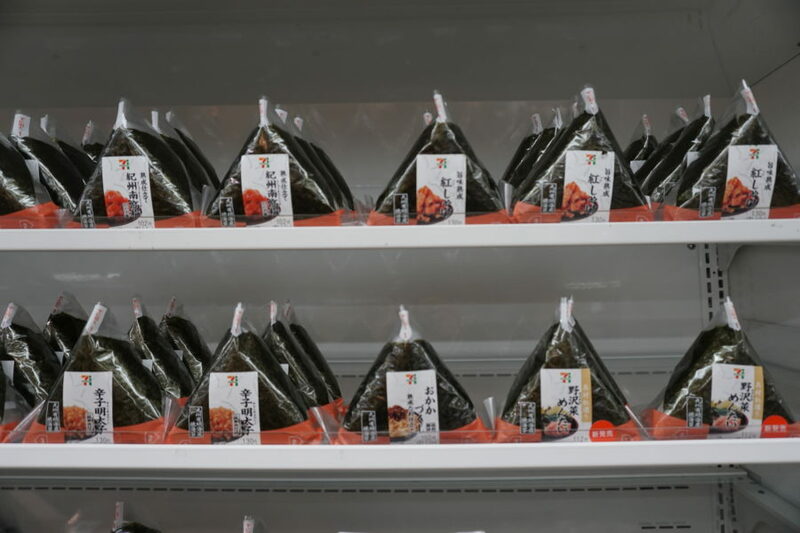 I was thrilled to see an onigiri shop open in my NYC neighborhood– until I saw they were charging $3.50 a pop. 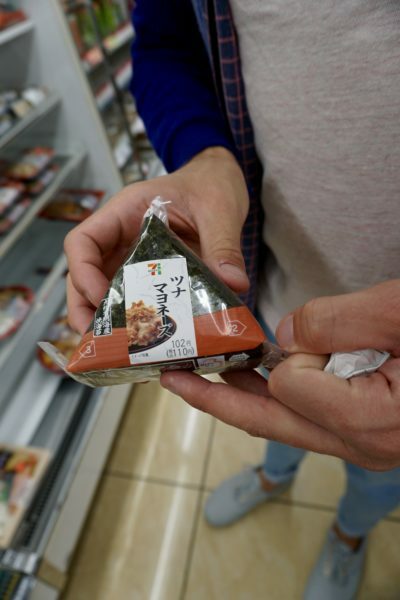 Onigiri stuffed rice balls come in many different flavors– but it can be hard to tell what you are buying unless you can read Japanese. Other takeout food to consider: fresh and tasty sushi, soba noodles and other treats. 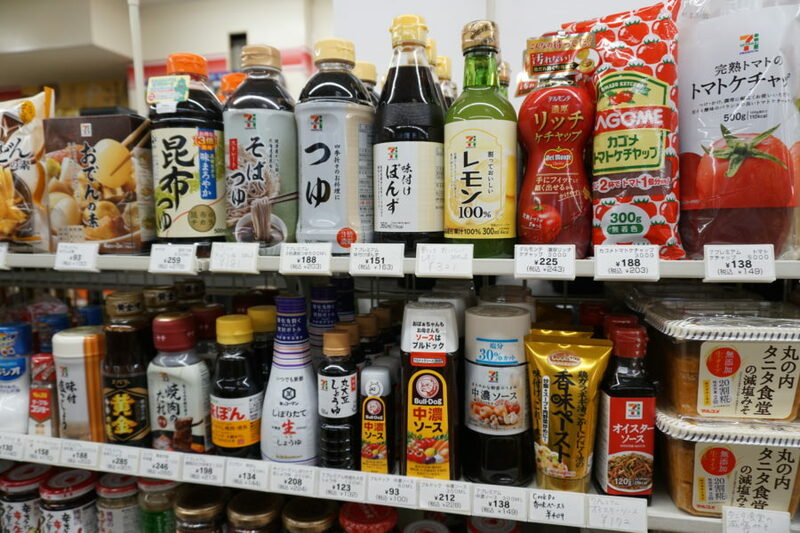 Whereas my 7-Eleven might have one dusty Kikkoman soy sauce, the Japanese 7-Eleven had several shelves worth of soy sauces to choose from. Japan is famous for its fun, crazy and delicious candy. 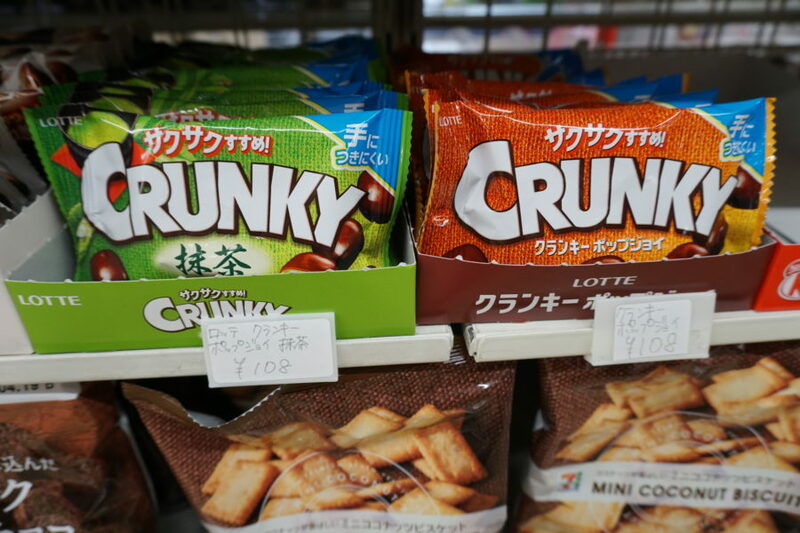 I’ll explore all the favorite Japanese candy in a future post, but just be aware that the Japanese 7-Eleven candy aisle puts the US one to shame. If you;re overwhelmed by the selection, you can’t go wrong with Japanese flavored KitKats. 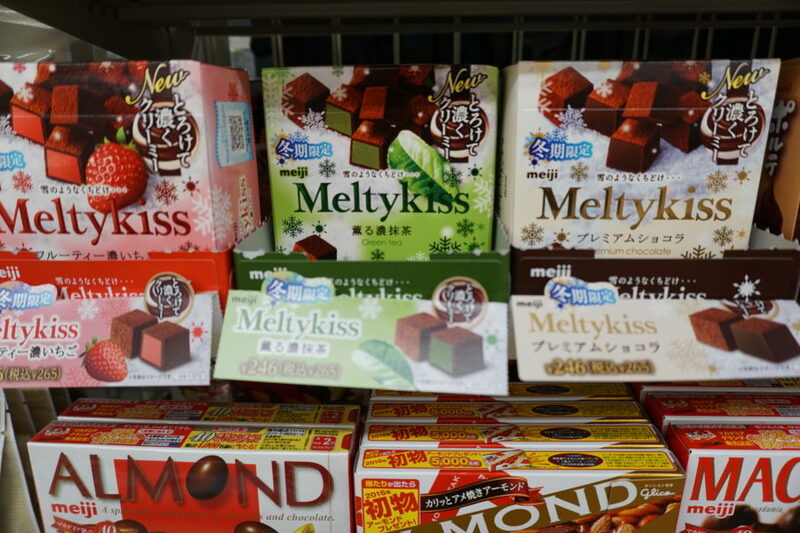 Melty Kiss is a popular Japanese candy favorite. I devoured a bag of Japanese potato chips in one evening if that tells you anything. Totally addictive. Especially the first ones in the second row. I went through an entire bag of these in one night. Japanese drinks are fun to taste test– often you’ll have no idea what something actually is until you try it. But fortunately most of what I tried was pretty tasty. Like in the US, energy drinks are very popular. You may have fond (or not so fond) memories of Cup o Noodles and packaged ramen soup from your college dorm days. I promise you haven’t seen anything like the entire aisle filled with soup and noodle selections. Not sure what this is? But I definitely wanted to try it. 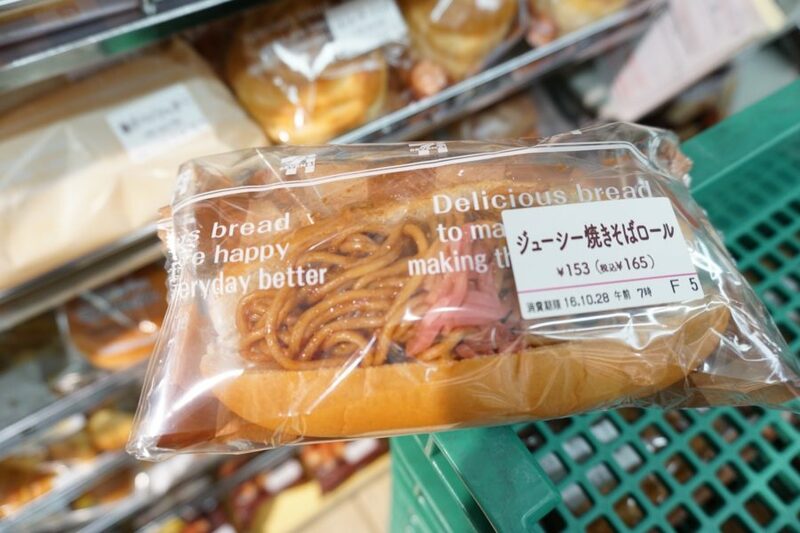 Apparently in Japan, anything can go into a hotdog bun and make a tasty sandwich– whipped cream, noodles, actual hot dogs (at room temperature). While I did not try any of the sammies, they were fun to browse. I took a pass at these packaged Japanese hot dogs. 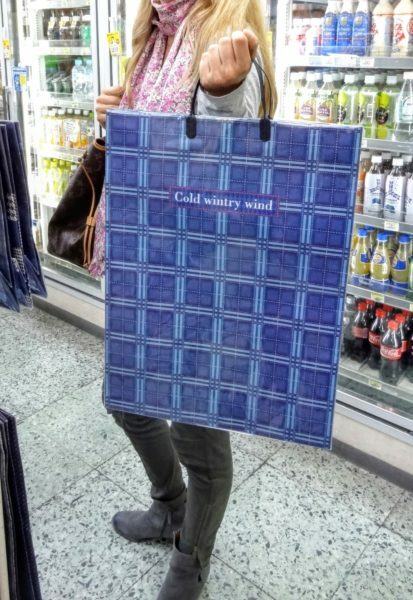 Why not pick up a tote bag with some charming engrish. 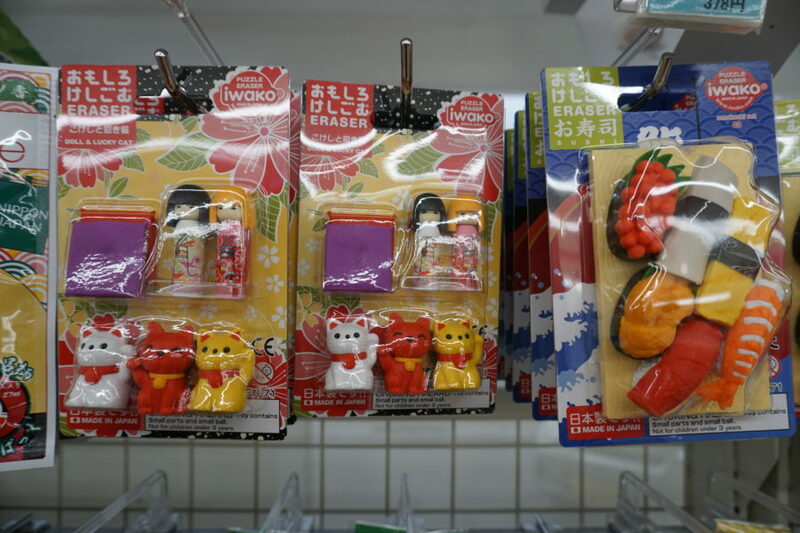 How cute are these little packaged toy sets. You’ve seen the photos of Japanese wearing face masks, especially while on subways and in the crowded city streets. 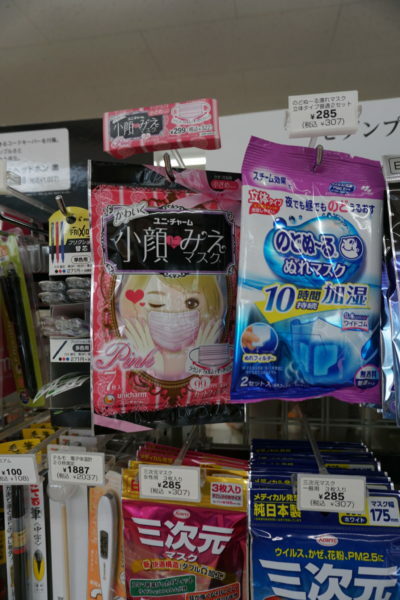 Unsurprisingly, the Japanese 7-Eleven stocks a full selection of face masks. 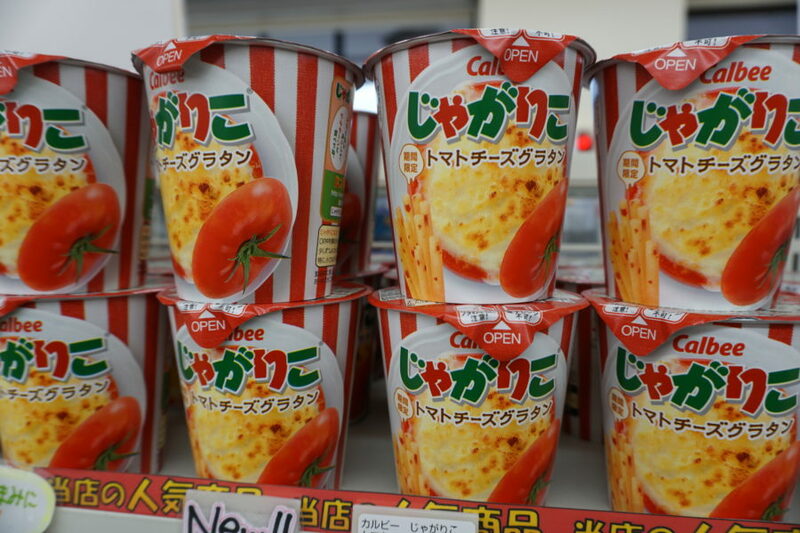 Have you been to a Japanese 7-Eleven? Tell us about your favorite finds! Disclosure: my visit to the Kanto region of Japan was hosted by JTB, however I can assure you that my 7-Eleven shopping picks are entirely my own. As I stated in another post, I haven’t been to Japan yet, but it’s on my bucket list for post-retirement travel. I hope you’re able to eat some of the stuff you buy before taking it home, especially sandwiches filled with meat or cheese, which you know can’t be taken through Customs. Just so you know, most 7-11s have regional things. In the south you can buy all things south. When I lived in Hong Kong 7-11s had all things Chinese incudling one store that was owned and managed by Buddhist monks. The 7/11 branded savory rice snacks with fried salmons skins are to die for!!! Ah good to know, I’ll look for them next time! !